Manufactured in Allemagne from 1958 until 0. In the years which followed the WWII, France occupied part of Berlin and part of south-west of Germany, more exactly Lander of the Saar. 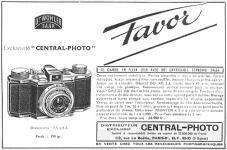 During this period, the firm of Dr. Wöhler assembled some Leica IIIa and manufactured Favor. The model of my collection (1955 ou 1958) has an advance lever. Its shutter is Prontor-SVS (1/300 secondes). The lens is Color-Docar 2,8/4,5cm. The back and the base of the camera separate completely from the remainder of the camera. The finder is very small. This model does not have a bolt against inopportune release, contrary to the former models. On the embossing which protects the finder, it is registered Favor Dr. Wöhler Saar. 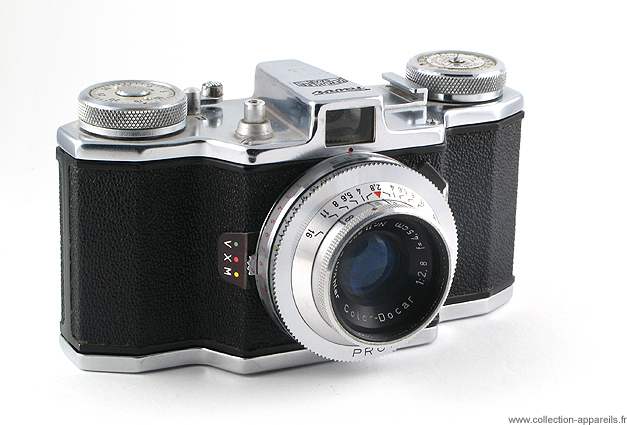 With nearly fifty years, this camera is in an exceptional state of freshness. 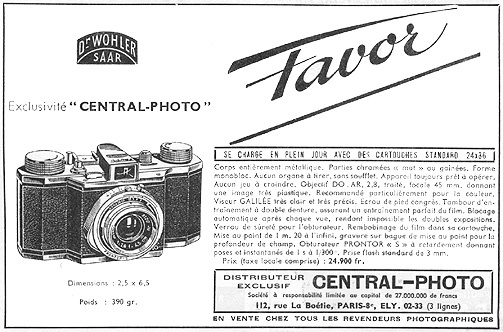 The job number is registered inside the camera (here n° 21.777).